This is all about Craigslist (CL) and material things. It’s about some specific reasons I think you should buy things on Craigslist, if you are planning on buying things anyway. I had been chary of buying on CL. I’d sold stuff and I knew I was honest, but I wasn't so sure about other people. It seemed like a hassle and it seemed risky. And then my sister convinced me to try it with the first item here, the Ikea desk, and I really haven’t looked back. Proof-of-concept. I was with my sister, about to buy this Ikea glass-plate + sawhorse = desk. New it’d have been around $120. I am about to buy it at the store. My sister thinks to check CL. The exact thing I want is being sold for $40 a block away from where I’m staying. I’m torn; it means calling someone, what if it’s gross, what if it seems shady, etc. But I go ahead and call. The next day I meet Stacie, my lovely neighbor, and talk to her about the neighborhood, the move between Los Angeles and London and how her British husband is just nuts for the weather here, the difficulty of finding a rental as nice as theirs (a small but stylish house). Friendly neighbor stuff. Get the desk in I’d say “practically new” condition at a 2/3 discount. I have wound up buying a bunch of computer stuff on CL, but one particular experience changed how I’ll purchase computers in the future. I wanted a gaming system: something powerful and graphics-y. I was worried about electronics and computers on CL: no comfort of a corporate warranty that will probably screw you over but at least will for sure be there to screw you over. I nonetheless thought I’d poke around. I found Steve, who is fantastic and if you are looking for a performance machine seriously get in touch and I’ll give you his info. Steve takes me through a very involved self-education process about this purchasing decision, involving motherboards and graphics cards and upgrade capabilities and my research into comparable systems. About 20 emails, many long. This obviously makes Steve a customer service hero (and also possibly explains why he struggles to make a lot of money doing this). It’s worth noting that it also took up my time, so if you’re not up for that this process may not be for you. But I was game to get a little educated; it was part of my goal with a nicer system. I eventually stop faffing around and one weekend drive to pick up the system. Steve shows me how to install a graphics card and teaches me a number of extremely useful things about BIOS controls that I’m really glad to know. Again, if Steve-who-sells-computers is some kind of crook, he’s going to a lot of trouble to create an office space and real-world identity that both corroborates his larcenous cover narrative and makes him pretty easy to track down again. Which I’ve done repeatedly with several small questions, all of which were also immediately dealt with. When I thought the fan was a little noisy, Steve simply sent me a new one without my asking. Steve is an audio engineer who does this for some extra money, though to hear him tell it his margins are tight because he’s squeezed by supplier power on one side – as a very small scale retailer, he doesn’t get the components for much cheaper than I could – and competition from other custom builders. Looking at the cost of the components of the system, I think he’s being straight about that. The superiority of this experience to the one I had in mind initially – spending twice as much money for less computer loaded with bloatware and with limited support – has been completely revelatory. I don’t think I’ll ever go back. Further and more importantly: yes, I had to drive and pick this up myself. But again that afforded me the chance to meet someone. Joseph and I chatted about his moving in with his girlfriend, my absolutely-not-moving-in with a girlfriend of any kind, some restaurant tips in West Hollywood and some guidance on good less-crowded beaches for surfing. I wanted a nice chair. I was talking to a broker; a guy who runs an online business that sells used office furniture through CL and other outlets. We were negotiating over this fancy office chair that sells for $800 or so new that he was selling for $250. I tried to get him to come down a little – everyone comes down a little on CL, sometimes more than a little – and he wouldn’t. He was weird about responding: delayed and elliptical and always all caps shouting. So the morning that I had sort of planned to go get the chair from him (but hadn’t yet heard from him to confirm), I took a quick look on CL. And less than 30 minutes later I was handing Hakim five dollars – FIVE DOLLARS – for a less fancy but very nice pneumatic adjustable office chair in great condition: clean, no scratches, no nothing. FIVE DOLLARS, for a chair that was a ten-minute drive away, from a dude whom I chatted with for ten minutes about my move and his favorite bars in Santa Monica. Lesson #5: You can buy bikes with a clear conscience. But it’s hard. I shared the common concern that I might be completing a market for stolen goods by buying on CL. The more I bought on CL, the more naïve this seemed. I definitely had a few interactions with people that seemed shady or off-rhythm. So I just dropped the communication and didn’t buy from them. I’m confident that, if anything, I was overly cautious and kyboshed transactions with some completely legitimate people. But bikes were harder. I had been warned that they’d be harder, and they were. It was just the percentages: a much larger fraction of the posts seemed obviously shady, and I had many more off-kilter interactions. Including several with what I took to be obvious red flags: two sellers who disappeared entirely at requests for a serial number to check the bike against stolen bike registries, for instance. I had sort of given up, particularly because bikes are complicated toys and I don’t know much about mountain bikes. But I was lucky and had some help from awesome friends who kept trolling, so the happy if unexciting conclusion to this story is that once again CL delivers. There is no way that Oleg and Marina stole these bikes. They invited me into their home. They had men’s and women’s bikes that fit each of them, and a new daughter and no time to use them. They commiserated with me about the fact that I had neither a wife nor a fiancé nor, no, not even a girlfirned who might be interested in buying the hers bike to match the his I was purchasing. Oleg laughed at me kindly when I offered my car keys for him to hold while I took the bike out for a test ride. They were just a married couple selling a bike, and my willingness to buy means that it got sold and means I got a really solid entry-level mountain bike for an approximately 50% discount. I applaud you if transact on CL, and exhort you not to turn up your nose if you don’t. Be cautious and thoughtful and all of that, of course. But there’s good stuff. For cheap. I saved, by my estimate, around $2000. And you'll be part of a nice, sensible way of efficiently allocating unused stuff. It's a good marketplace! For me going forward, it’s always going to be the first stop. This is Range. You’re pleased to meet her. 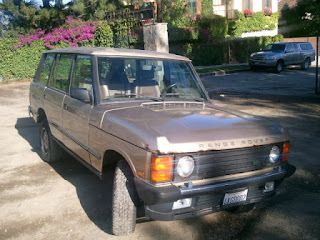 I purchased Range for $3300 from my friends. She’s a 1993 Range Rover with a “Long Wheel Base” and a zillion miles on her. The price was going to be $3000, but then some work was required at the last minute so it got raised to $3300. And, within ten days of purchase, she needed to have her high-pressure hose (the one that conducts the power steering fluid from its reservoir) replaced because it was leaking for $220. So let’s put her price at $3520. If you look at the prices on nada.com this is not a great big steal, but it’s a pretty good price. I suspect the Nada quote is misleading. I would’ve wound up spending more than that, and then more importantly because Range and I are in love. I like how high she sits: the heads of men in sports cars are literally beneath my knees; I’m looking down on them from the mezzanine. I like how Range drives: the shocks aren’t exactly pillowy, she’s loud and feels powerful and sure, particularly up canyon roads and craggy dirt roads, where the 4WD comes in. I want more of that, more offroading and tracks that require all four wheels. Range has some heft on her, and the whole “just throw stuff in the back, it’ll fit” is practical and amazing. Bikes, scuba gear, furniture. A lot of freedom and flexibility comes with a big car. Drawbacks as well, yes. Gas mileage: abysmal. Like 15mpg on the highway. Turning radius: very wide. Parallel parking only in large spaces. I see why people say “I wouldn’t want to have a big car” and sometimes I envy the drivers of zippy little whips. But none of that matters when you find someone you really connect with. Range and I understand each other. She’s rusty and messy and banged up, but fundamentally sound and well-made. No fussiness or worry: dings and bangs and rust and scuff is already written all over her, so nothing cosmetic is going to change the picture. Her color is “Roman Bronze”, and it is great. It is Roman Bronze. She’s screwy: you have to wait for 30 seconds after turning the engine over to put her in drive. Why? I have no idea why, just wait for those little lights to off and you’re good. Rear hatch doesn’t lock. Rear right side window off its track, only goes up and down “manually” (grab window from both sides, muscle it). Sun roof really needs some WD40, which I can never remember to get. All I need Range to do is run and be her bangaround rough-and-tumble self. She’s no jalopy – she’s Roman Bronze. And she’s a passport to things that are good things; to camping and mountains and biking and rivers. I’ll post any dramatic updates, but until informed otherwise she’s the one for me. note: "wireless" is a 2-syllable word. I almost certainly saw Superman as a kid, but I didn’t really remember it beyond certain iconic scenes and shots I’d seen since (“Who’s got you?!”). I watched it again recently; I enjoyed it a lot. Mostly I was moved and charmed by Reeves and Kidder: it really captured her sense of total wonder at him, which translated into my experiencing the wonder of him. “Superman”! A beautifully nice super man who flies and is so good! Magical, if it actually lands. I also found the movie silly, maybe inevitably; I buy that Richard Donner deserves credit for making the film more serious and less silly than it might’ve otherwise been (and thereby clearing the way for Singer, Nolan, &.) but it still reads to me, now, as a bit goofy and campy. I happily continued on, however, and watched Superman II, forgetting about the fact that there are different versions: one by Richard Donner and one by Richard Lester, the latter being the theatrical release after some Hollywood creative differences stuff between Donner and the films’ producers, the Salkinds. So I stumbled into the Lester version, and I was totally appalled. It’s a slapstick trivial mess, tonally very different from the first film and much less successful. The magic of the relationship between Lois and Superman, which really has elements of myth about it in the first movie (flaws and all), is brought down to a telenovela level of interest and complexity. Any rules about Superman’s abilities go out the window: he can just do anything (e.g., project giant red energy net “Superman S”s from his chest). All the corny gagsy bits with the pedestrians in the street, muttering funny things during the super-fights and losing hair pieces. It’s awful; upsetting and awful. I sorted out the version thing and re-watched the Donner version, kind of suspecting that I might be overdoing this and wasting my time. I also watched the bonus features, which include an interview in which he tears up a little when he talks about being taken off the films, and about what might have been: how Lois and Superman’s relationship could have grown, in particular. Watching his version, I found that I was almost immediately captured by the same sense of lost history. The Donner cut of Superman II is a stronger movie than Superman. It integrates with the first narratively and stylistically in a deeply satisfying way – which is to be expected, since they were made as an integrated pair. Most of all, it builds on and enriches the Lois and Superman connection. This is due, again, in no small part to how just awesome both Reeves and Kidder are; the scene where she shoots him was the screen test, and they’re still both awesome. Its quality is mostly in the overall construction and tone of the film, though. By engaging me in those characters and that relationship, the film drew me into its wonder and epic-ness and I gave me a world that looks mostly like my own with a few notable exceptions. It’s a place that I, like Donner, am sorry I didn’t get to go back to more. I’m choosing to write about this Lester/Donner version thing because I see it in terms of a problem of large commercial feature films gone wrong, which is in turn a facet of many failed creative efforts: a sense of not-thingness, of being just the aggregation of a bunch of creative workstreams, incentives, and market demands rather than the product of a vision. In addition to the fact that I personally found many of the elements of the Lester version annoying, the whole thing simply failed because those elements didn’t fit together to create an integrated whole. They were overlaid on Donner’s foundation, and none of it sat together at all. I don’t think this is a necessity of commercial film, by any means: Pixar makes movies that are very coherent and vision-y. I thought a nice thing about Avatar was how it also avoided this; say what you like about the script or facile political commentary, Avatar definitely has thing-ness: it’s the product of a unified and coherent vision and fits together as such. When you sufficiently degrade the thing-ness of a thing, it becomes an insult to its category. I’m thinking of books now, particularly business books. Many of the books I had to read in business school were not really books; I don’t mean the textbooks, of course, or essay collections, which were naturally compendia and meant to be such. I mean things that were supposed to be “books” in the sense that we generally conventionally mean it: long-form prose with an aesthetic, logical or narrative through-line. Things that are together with themselves. Even crazy books, books that are formally nuts, have this: Naked Lunch has it. This is not to say that these non-book books contained no good content; being smart or elevated or “good” is not the essential quality that makes a book book. But piecemeal things put together with absolutely no regard for form are in important ways not “works”. I think that’s the key: with absolutely no regard for form. This may stem in part from biases I developed in grad school, but a total alienation from the integrity of aesthetic form seems to be to blame for a lot of aesthetic clanginess. That’s all I’ve got on this. I think the upshot is to really be sure you get the Donner version if you ever watch or rewatch Superman II.